Can you think of some good uses for fire? If you've ever seen Smokey the Bear, you know that “Only YOU can prevent wildfires." Over the past several years, you've probably watched news reports about the great damage that wildfires can cause. In addition to destroying beautiful forests, wildfires can burn homes and even take lives. Did you realize, though, that not all forest fires are bad? It's true! Sometimes forest officials set fires on purpose. They do this when they use a forest management tool called a prescribed — or controlled — burn. Many kids don't realize that fire is a natural part of a forest's life cycle. At times, other plants can grow on the forest floor, choking out desirable trees. This makes it more difficult for good trees to grow and for animals to find food and places to live. Fire can burn through these unwanted plants, making more room for desirable trees. This, in turn, makes it easier for animals to find homes and food. In fact, the seeds of some of the most desirable hardwood trees need fire to crack open their shells before they can take root and grow into a tree. Sometimes, these necessary fires occur naturally. For example, a thunderstorm may send a lightning bolt into a forest, starting a wildfire that burns away some of the unwanted underbrush. Unfortunately, these wildfires may also burn good trees in the process. At other times, though, forest officials start fires purposefully in areas that need to be cleared. During a controlled burn, forest officials monitor the fire closely and put it out when the unwanted plants are gone. They keep the fire in check, so that it does not burn the good trees. In this way, a controlled burn can prevent future wildfires. During the next thunderstorm, a lightning bolt might strike, but if there's no accumulated underbrush present, a wildfire might never spread. Prescribed burns can also save trees from diseases and insect infestations. Invasive plant species sometimes choke out good trees. 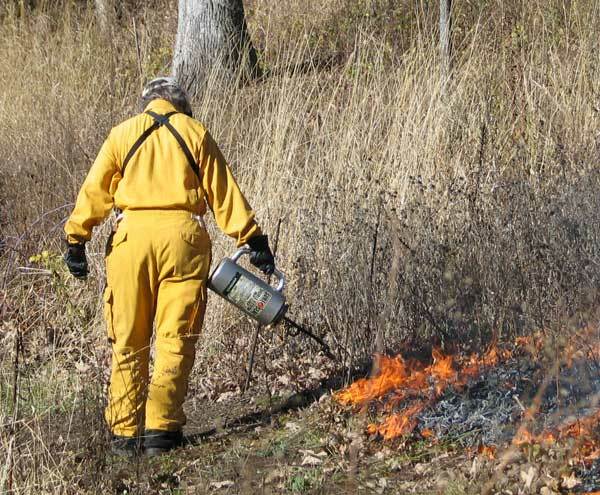 A prescribed burn can eliminate these invasive species — and the diseases and insects they carry — and thereby improve the overall health of the trees in a forest. Controlled burns usually require a special permit and must be carried out by fire or forest officials. Fires are often ignited with a special tool called a drip torch. A drip torch pours out a steady stream of fuel onto the ground, so the user can control where the fire starts. Tomorrow’s Wonder of the Day is really slow, so we apologize if it seems like it will take forever to get here! What better way to extend your learning about fire than to experience one up close and personal. That's right. It's time for a campfire! Get a few friends or family members together for an old-fashioned campfire. You'll need an adult to help get the fire started and oversee it. Once it's going, roast hot dogs or fix s'mores. Tell the others about today's Wonder of the Day and what you learned. You can even finish off your evening with some fun ghost stories! Now that you know that fire can be used as a tool to encourage future growth in forests, think about some other ways that fire is used as a tool. Fire is very important to human beings. What ways have you used fire as a tool recently? If you've gone camping in the past, you may have used fire as a tool to keep warm. You may even use a fireplace to heat your home in the winter. Without fire, many places in the world would be uninhabitable because of extreme cold weather. If you've ever started a campfire, you might have also used fire as a tool to cook food. Of course, fire can be an important cooking tool at home, too, especially if you have a gas stove. Can you think of any other ways fire is used as a tool? Up for a challenge? Visit a local, state, or national forest near your home to interview someone who works there managing the forest. Ask them about controlled burns. Do they do them? If so, how often? Is there one scheduled in the near future? Could you document what they do for a special report you could present at school? What other ways do they manage the natural resources in the forests they oversee? Ask how you might be able to help out with forest management in your area! HI wonderopolis!, I wonder how they start. I wonder more about the california one last year! Hi, Jayden! Forest fires sometimes start naturally, such as by a bolt of lightening, and sometimes, they are started by forest officials in areas that need to be cleared. During a controlled burn, forest officials monitor the fire closely and put it out when the unwanted plants are gone. They keep the fire in check, so that it does not burn the good trees. Oh, no! Thanks for catching that, Gregg! You're right - the correct answer is "invasive species"! Great question, jack!! Why don't you take a Wonder Journey to see what you can find out? Thanks for WONDERing with us! Hi, ethan! Forest officials will monitor the fires very closely and put the fire out once unwanted plants are gone! Thanks for WONDERing with us! Hi, jack! Though some controlled forset fires are beneficial to the forest, this is not always the case! Thanks for WONDERing with us! Can you do football teams please. We think you may like Wonder #126: What's So Super About Super Bowl Sunday? Let us know what you think!! Thanks for WONDERing with us, Chance!! You're right, Sky! We're glad you're WONDERing with us!! This article is a great resource for research on wild fires! We're glad you found this Wonder helpful, Brett!! Glad to hear it, Dominic! Thanks for WONDERing with us! That's cool, Mike. Was this Wonder helpful for you? We hope so! Good luck on the report! You can explore the answer in the text above, abby. Thank you for visiting Wonderopolis! if my dog is 4 then how old is she in dogs years? thankyou for helping me Leand alote on wildfires. you can stop a fire but fires can still be bad because if you don't stop the fire it can destroy many things. I learned a lot of things from this WONDERing! I had always thought of forest fires as always a bad thing, but this WONDERing changed my perspective! I learned somthing very important from this video and I am now not afraid! That is very interesting to me I learned something! Wonderopolis, Thank you for a great wonder today. It was an interesting new point of view about forest fires. Thanks for your insight! Hey it's me again I have seen a forest fire but I learned that not all forest fires are bad. I was riding in my dad's truck when I saw the forest fire. I think tomorrow's wonder of the day will be about plants or growing plants. I would be really scared if I had to start fires! I guess that the wonder was going to be about fires and I was right yeah! Last year I researched about fires I found out heaps of amazing facts my poster was better than every one else in the class! That's cool that you teach students. I never knew that forest fires caused so much damage, and how much time does it take for a forest fire to get that big? So I get how forest fires can be good, but how? I didn't understand the video exactly. Did it mean it makes the plants healthier? Thanks for making this one! I've always wanted to know! It must be scary to be in a forest fire, if you live near it. I would freak out! Thanks Wonderopolis! Last summer we saw the devastation that forest fires can cause. We didn't know that there could be good reasons for burning the forests. Thank you! I was right!! I made predictions and guessed that the wonder of the day was going to be about forest fires and I was right!!!!! We learned stuff about fires. We learned that fire can help desirable trees break out of its shell. Thank you Wonderopolis! I really thought all forest fires killed nature. Now I know it's actually very useful. Thanks for posting this! I don't get it I was told all forest fires are bad! So does that mean forest fires won't always hurt you? We think tomorrow's wonder will be about a person growing up or plants growing. I always thought forest fires were bad and they hurt the animals. I never knew how helpful they can be. I didn't know some people practice burning out forest fires. It was a great video. At the end, when it was on the news, I was like, "This is on the news!" Again, great video. Which of the following is a natural part of a forest’s life cycle? Prescribed fires are often ignited with a special tool called a what? A prescribed burn can improve the health of a forest by eliminating what?